The City Course is offering a holiday punch card good for four rounds of golf with cart for only $108.25 (after tax). These punch cards can be used on any weekday or weekend of the recipient’s choice. Four rounds of golf on a weekday would normally cost $141, and on the weekends it would be $165. So this is a great deal for the golfer in your life! The cards expire on May 31, 2019, so all rounds must be used by that date. To purchase your punch card, visit the City Course Pro Shop at the Phillips Event Center. Hurry, supplies won’t last forever, and once they’re gone, they’re gone. The City Course at the Phillips Event Center is a regulation course that carries modern style throughout each of its 18 challenging holes. Formerly known as the Briarcrest Golf Course, the course was first opened in 1971. The Dr. Marvin H. Ferguson design offers a park-land style of play with tight fairways and small greens that are sure to challenge any and all golfers. From the champion tees, the course measures 6,748 yards and is rated at a par 72. The greens are well maintained Champion Bermuda and are a highlight of the high standards of quality brought to all golfers at a fair price. This short par 5 calls for a strategic tee shot. Long hitters may want to chance an attempt over the hazard, though doing so requires roughly a 280 yard carry. A safer route is to lay up about 215 yards on the right side of the fairway so as to have a clearer shot to the green. The first par 4 asks golfers to consider their tee shot club. The shorter length rewards a well struck hybrid or fairway wood, but tempts long hitters whose driving accuracy can place their second shot within 100 yards. The left side of the fairway is the target for an unobstructed approach. This simple approach to the green masks a challenge. A wide fairway lets players enjoy a riskier tee shot, but the heavily undulated green requires accuracy on the approach. Golfers who enjoy strategically placed approaching irons shot will find themselves rewarded on this hole. Four is perhaps the toughest of the par 5s. Though still shorter, the narrow tee shot may cause the driver to stay in the bag so as to avoid the trees along the right side of the fairway. A tee shot placed along the left side of the fairway to 220 yards from the green puts players in a position to reach the green in two. The first of the par 3s masks its difficulty with the surrounding trees. Slightly uphill and predominantly facing the wind, this hole typically plays longer than the distance reads. A tee shot placed center green allows the player a good par chance no matter the pin location. Six is the number one handicap hole and challenges each aspect of play. Long hitters can be rewarded cutting the hard dogleg left, while average distance players must choose between a safe shot in the fairway, or an attempt to shape the ball around the corner. The green slopes heavily away from the approach, so a ball placed right of the hole and just short of pin high is the safest route. The difficulty of seven is the size of the green. Slightly uphill plays longer than usual, and the various undulations require golfers to consider shot placement that allows for an easier putt to the hole. One of the signature holes on the course, this short par 4 offers challenges from the tee to green. A shot left of the fairway obstructs the approach, while a long drive may roll into the hazard. A fairway wood or hybrid off t he tee will allow the golfer a straight approach into one of the largest greens on the course. Pin placement is key as a back pin may play a club longer than what distance reads. One of the longest par 4s, hole nine is uphill and predominantly into the wind. The tee shot is best played straight off the tee to the left side of the fairway that puts a confident club in hand for the next shot. Nine green is smaller than normal, the approach should depend on the pin, with front pins dictating a below the hole ball and back pin approaches played best at the middle of the green. Hole 10 is a fun start to the back nine. This short par 4 is best played with a 180 yard club straight off the tee so that the ball will roll down the hill and leave the approach less than 100 yards. This long par 4 requires attention to wind. An accurate tee shot at the right side of the fairway will cut distance on the approach, though a safer shot to the high side of the fairway on the left leaves less room for error. The approach club should be long enough to reach the green as elevation and wind add greater than perceived distance. A short straight par 4, twelve rewards both risky and safe play. The wide fairway allows for a powerful drive, but those that enjoy strategy will enjoy hitting a tee shot that places their best distance club in hand. The sloped green is deceptively short, so often a club less than normal will be sufficient. Any shot to the left will make par almost impossible. Thirteen is the shortest of the par 3s, so a well-placed tee shot often rewards a birdie. Tee placement is key to this short, hard dogleg right. Long hitters may cut the corner, but anything right of the dogleg is hazard. Strategic play calls for a hybrid or soft fairway wood straight off the tee, leaving less than 150 yards into the green. Another marquee hole of the course, fifteen is the longest but widest of the par 5s. A well struck tee shot to the right of the fairway leaves the chance for an open third shot into a short undulated green. Hole Sixteen: The second signature hole, sixteen is a long uphill par 3 with a wide green sloped heavily toward the hazard. The green is guarded by water and bunkers on all sides. Distance is crucial; the tee shot must factor in both elevation and wind to insure proper length. The second signature hole, sixteen is a long uphill par 3 with a wide green sloped heavily toward the hazard. The green is guarded by water and bunkers on all sides. Distance is crucial; the tee shot must factor in both elevation and wind to insure proper length. This dogleg left is one of the longer par 4s due to its vulnerability to wind. A straight tee shot may place long hitters through the fairway, while the average golfer should consider a shot middle left of the fairway so as to shave distance off the approach. The finishing hole uses elevation and hazard to challenge players. A long tee shot may find its way to the water, so a lay up to 230 yards on the left side of the fairway offers an unobstructed heavily uphill approach. Players should pay attention to wind, as well as decide if a two or three shot approach is the best plan. Call 979-776-1490 for a Tee Time or book your tee time online. Take, either S. Texas Ave. or S. College Ave., to W. Villa Maria. Head east on Villa Maria. Villa Maria becomes Briarcrest Dr. Turn left on Country Club Drive. The entrance is straight ahead. Take Texas 6 North, exit Briarcrest and head west. Turn right on Country Club Drive. Take Texas 6 South, exit Briarcrest and head west. Formerly known as the Briarcrest Golf Course, Mr. Wallace Phillips graciously donated the 107-acre golf course located on Briarcrest Drive to the City with Bryan City Council formally accepting the donation on December 12, 2017. 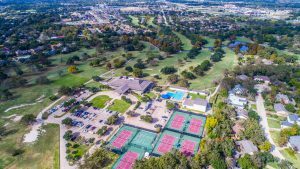 The City also purchased the large practice green and driving range located on the Clubhouse property and will lease approximately 6,000-square feet of building space to provide a Senior Center for special activities and programs. Learn more about the Phillips Event Center, Pro Shop, Country Club, and other amenities at phillipsevents.com.